A herbal tea for weight loss. No side effects of using this tea. Extra fat dissolving herb and anti-cholesterol herb. A herbal tea for weight loss. No side effects of using this tea. Extra fat dissolving herb and anti-cholesterol herb. 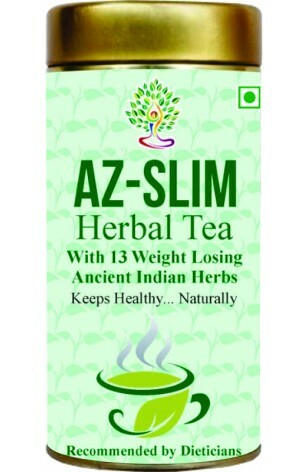 AZ Slim Tea reduces extra lipid of the body. It is a natural herbal tea for relief body pain. Useful in body heaviness to decrease the bad cholesterol. Increases the elasticity of the body, enhances the metabolism of the body and breaks down the fat lobules. Useful to strengthen the immune system. A herbal tea for slimming, useful for maintaining the ideal weight of the body. The herbs in AZ Slim Tea stimulate body's natural metabolism. AZ Slim Tea also enhances digestion mechanism, helps in excretion of fat from body, helps inhibits bad cholesterol and boosts good cholesterol and enhances vitality.